March 8, 2012: Recipe updated to include Nutritional Information, entered by Christine Cummins, Nutrition Student, West Chester University, West Chester, PA.
Cauliflower that has been steamed, and then mashed or pureed, is a super-fantastic substitute for potatoes! It’s also a BIG O on the Carb Light Living™ program! Break the cauliflower into large sections or florets. Steam until tender. 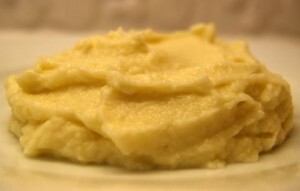 Use a hand blender, hand mixer, or food processor to puree the cauliflower. Add the low fat half and half, the butter, and salt and blend. 1. The mashed cauliflower is wonderful as it is. However, you can add garlic or Parmesan cheese if you like extra flavor.